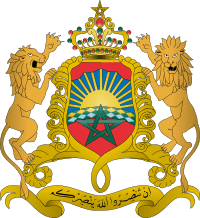 The Cabinet of Morocco is the chief-executive body of the Kingdom of Morocco. The Cabinet is usually composed of some 25 ministers and 5 to 10 "Secretaries of State" and "Minister Delegates", it is headed by the Prime Minister (officially Head of Government since August 2011) who is appointed by the King of Morocco from the party that achieved a plurality in the parliamentary elections. The Cabinet's ministers are chosen by The PM, after consultation with other parties forming the Government coalition, then validated and appointed by the King. 1 2 3 4 5 6 7 8 "Historique des governement". Maroc.ma. Retrieved 11 June 2012. ↑ "Morocco - Central Intelligence Agency". CIA. Retrieved 12 June 2012.